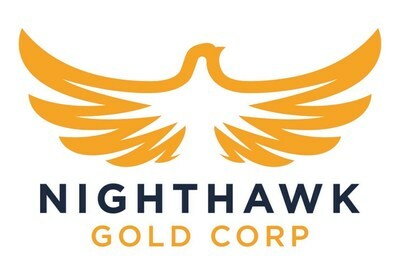 TORONTO, March 19, 2019 /CNW/ - Nighthawk Gold Corp. ("Nighthawk" or the "Company") (TSX: NHK; OTCQX: MIMZF) is pleased to provide results from the latest metallurgical testwork on the Colomac Gold Project ("Colomac"). Four bulk drill core samples were collected from 21 boreholes covering 7 mineralized zones within the Colomac and Goldcrest sills. The results are presented in Table 3 and include a summary of test results from all three preliminary metallurgical studies now completed. Findings continue to reveal: a relatively uniform hardness for material tested to-date; that the rock is amenable to all standard gold recovery technologies; and using a combination of gravity and cyanide leach recovery processes, testing showed that gold recoveries for all six bulk samples tested to-date range from 96.3% on the lower-grade material up to 98.0% for the higher-grade material, representing a significant increase in recovery over historic production results of 88.1% (1994 to 1997). Dr. Michael Byron, President & CEO commented, "So far we have tested six samples that cover a limited portion of the deposit, however we are extremely encouraged as we continue to see tremendous consistency in terms of grind characteristics, gold recoveries, and responsiveness to all standard gold recovery technologies. The current program was intended to broaden sampling both laterally, and to depth, and to test material from several other mineralized zones. The results have been exceptional and show a very strong consistency in physical characteristics throughout the seven zones tested to-date. We will continue to expand metallurgical testwork in 2019 to additional areas of the sills, including more bottle roll and column leach tests to address the potential heap leach option for Colomac." Results to-date compare favourably to similar North America projects. Cyanide bottle roll and column percolation metallurgical testing on half inch crushed material from the four samples is nearing completion and results will be provided once available. The Company will then have completed 6 bottle roll and 5 column leach tests offering valuable insight into the ongoing assessment of the deposit's heap leach potential. Additional metallurgical work will be expanded to include more mineralized zones and to address potential grade variations within the Colomac and Goldcrest sills. As in the previous sampling programs, testwork will be carried out on Colomac drill core from the most recent drilling. Testing was completed at Bureau Veritas in Richmond, BC, and audited by Starkey & Associates Inc. in Oakville, Ontario. Studies completed to-date have involved the current drill core mineral process testwork on four composite samples, one higher grade sample from Zone 1.5 (see press releases dated February 21, 2018 and May 22, 2018), and on lower-grade material consisting of three composite samples from various areas of the Colomac Main Sill (see press release dated April 19, 2017). Locations of the drillholes sampled for each of the metallurgical studies are shown in Figure 1. 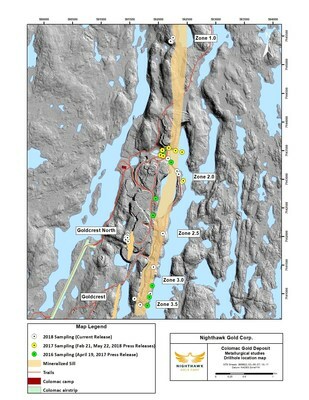 In 2016, three drill core bulk samples of similar mineralogical characteristics totalling 119.5 kg of lower-grade mineralization were collected from different regions (Zone 1.5 composite labeled as North Zone, Zone 3.0 and 3.5 labeled as South Zone, and Deep constituted various areas of the sill at depth) and elevations in the deposit to facilitate hardness testing (Table 1), and to address spatial and grade variations of the quartz diorite host rock (Table 2). Grinding test results indicate that all samples exhibit a consistent high hardness and show minor variability, thus they would present no milling issues (see press release dated April 19, 2017). A single master composite sample was then blended for the metallurgical testwork. Recoveries are summarized in Table 3. In 2017, a 70 kg sample of split drill core was collected from Colomac's High-Grade Zone 1.5, (Table 1) and submitted for identical mineral process testwork as was conducted on the lower-grade material, to examine the impact of grade on process metallurgy. Results showed an increase in recoveries over the lower-grade material from 96.4% to 98.0% (see press releases dated February 21, 2018 and May 22, 2018). The most recent campaign broadened sampling to other areas of the deposit including Zones 1.0, 2.0/2.5, 3.0/3.5 and Goldcrest North (Table 1). The testwork program was identical to the previous two campaigns, with each sample composed of approximately 70 kg of drill core collected from the respective zones. As in the previous studies, samples were assayed for gold (Table 1), tested for grindability using the SAGDesign methodology (Table 2) and for amenability to several gold recovery processes (Table 3). For comparison, results from all three generation of studies are summarized in the tables. Preliminary grinding test results for the current study show that all four samples exhibit a consistent high hardness, with minor variability, thus mitigating milling issues. The average SAG grindability for the four samples was measured as 13.29 kWh/tonne (Grinding from F80 6" to P80 1.7 mm) and 14.78 kWh/tonne for the Bond Ball Mill Work Index (closed with a 150 micron screen) on SAG ground rock, remarkably consistent with previous test results. Results from all studies to-date are summarized in the tables below and show that preliminary grinding testwork characterizes all samples as having a consistent high hardness with minor variability, and that the material tested responds favourably to the proposed process options. The four sample head grades varied from 1.34 gpt Au to 2.38 gpt Au as determined by fire assay, and were tested for gold recovery amenability, specifically by cyanide leaching, flotation, and gravity separation. Favourable recoveries were achieved for all process options. Gold recoveries by flotation ranged from 84.8% - 98.1% with maximum recoveries achieved at a feed size F80 of 75 microns, for Goldcrest North material. Preliminary testwork indicates that the Colomac deposit is amenable to all standard recovery technologies, however future studies will be broadened to include samples from other satellite gold zones and other zones to depth within the mineralized sills. Future work will also continue scrutinizing the heap leach potential of the Colomac deposit. The main objective is to confirm that the metallurgical responses observed so far will apply over a broader range of head grades and zone locations. The technical information disclosed herein was prepared under the supervision of Dr. Alice Shi of Bureau Veritas and Mr. John Starkey of Starkey & Associates Inc., who is considered an independent "Qualified Person" as defined by NI 43-101 for the metallurgical testing performed on behalf of Nighthawk Gold Corp. Mr. Starkey has supervised the metallurgical work reported on and has reviewed and approved the technical disclosure contained in this news release with respect to such work. This news release contains "forward-looking information" within the meaning of applicable Canadian securities legislation. Forward-looking information includes, but is not limited to, information with respect to the Company's continued metallurgical testing at Colomac and the timing and results thereof. Generally, forward-looking information can be identified by the use of forward-looking terminology such as "plans", "expects", or "does not expect", "is expected", "budget", "scheduled", "estimates", "forecasts", "intends", "anticipates", or "does not anticipate", or "believes" or variations of such words and phrases or state that certain actions, events or results "may", "could", "would", "might", or "will be taken", "occur", or "be achieved".